This is a map edit for the original Metroid. Screens, enemy and item placement, palettes, text, and more are all changed. The primary goal was to make the game more playable - the discerning player will note the careful placement of platforms and enemies to make jumps easier. However, beating the game will not be a cinch. 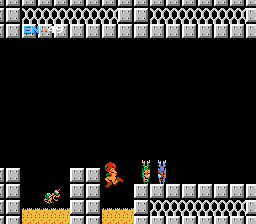 Items are much more difficult to get, corridors are contorted into winding mazes, and many of the energy tanks have been completely eliminated.